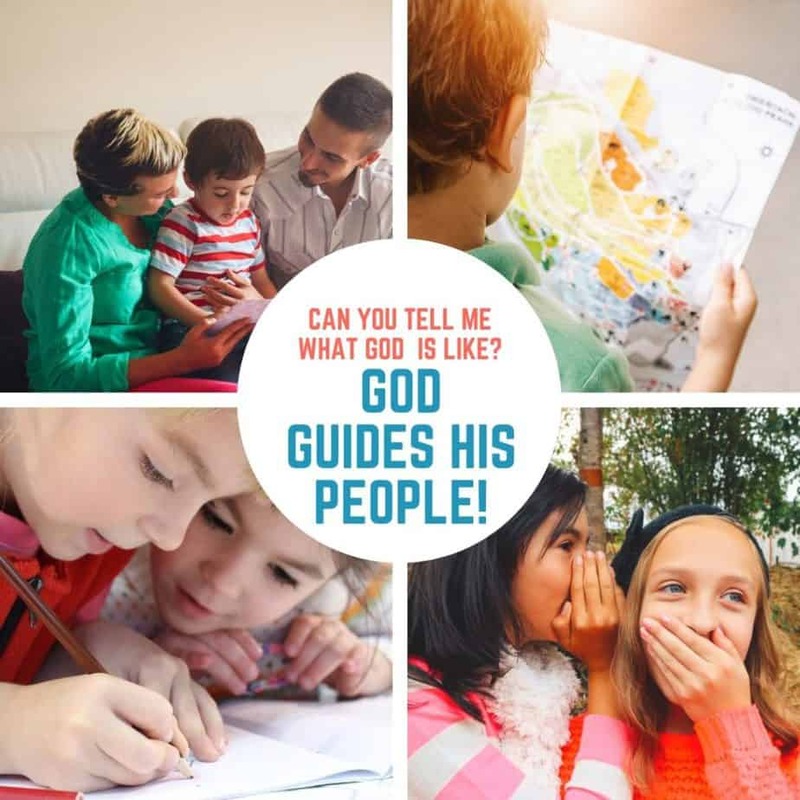 This is lesson 12 of 42 in our study on the Attributes of God called “Can you tell me what God is like?” Visit the series index to view all the lessons and get more ideas for using this curriculum in your children’s ministry. Ask if anyone can remember the truths we’ve learned so far. Explain that as this week we’re moving on to talk about God guiding His people that we’re going to play a game of follow the leader to review the other truths about God we’ve been learning. Do one of the motions and have the kids copy you and then tell you what attribute that motion represents. As each attribute is named, ask if anyone can remember the definition of that attribute. Then have the group read this week’s memory verse (Isaiah 58:11) from the poster. Explain that this morning you’re going to be talking about how God guides His people and what it means that God guides His people. God’s people had been slaves in Egypt and God sent Moses to bring them out of Egypt. After a series of plagues and finally the passover (where the oldest child in each home not marked by the blood of the lamb was killed), the Pharaoh has finally let the people go and they are on their way out of Egypt. As God led them out of Egypt He gave them something specific to lead them…. He went before them as a pillar of cloud in the day and a pillar of fire by night. This shows us that God was with His people and He was leading them each step of the way…their job was to follow. The pillar of cloud and the pillar of fire stayed with God’s people each step of the way…. (God guides His people by being with His people). When they got to the edge of the sea, God used Moses to part the sea and the pillar of cloud moved behind the people to protect them from the Egyptians. EXPLAIN: Talk about how we saw God guiding His people in this story based on the definition they just read. God accompanied them – He was with them in the pillar of cloud and fire, God assisted them – the pillar of cloud moved behind them while they went into the sea, the pillar of fire gave them light so they could travel at night, etc., God gave them direction – wherever the pillar of cloud or pillar of fire went they were to follow and when it stopped they were to stop. Since motions & actions help kids remember, choose an action for GUIDE. A good motion might be to motion with both hands for someone to follow you. The way this game works is that the leader will say one of the words of the verse and the rest of the group should say the next word. The leader should randomly say words in the verse to force the group to think about what comes next. After randomly calling out words, go through the verse in order saying a few words and the group following you by saying the next few words, etc. In our story this morning we saw God guiding His people out of slavery and leading them each step of the way with a pillar of cloud and fire. In this story, God was with them as He guided them and showed them the way. In John 14, Jesus tells His disciples that He’s going to leave them but that He will come back and take them to be with Him where He is going. Thomas (one of the disciples) gets confused and says to Jesus, ‘we don’t know where you are going so we don’t know the way.” And Jesus responds by saying that He is the way. The pillars of cloud and fire may have shown the people the way in the desert, but ultimately every time we see God guiding His people it points us to the truth that Jesus is the Way. He is the One we are to follow and its only by knowing Him and following Him that we can know God. Give each child a blank piece of paper provide markers or colored pencils. Encourage them to write the word guide somewhere on the paper and then write or draw something to help them remember this attribute of God. They could write the definition for guide or the memory verse or they could illustrate the story of God guiding His people out of Egypt. After a few minutes, bring the group back together and give kids time to share what they have drawn or written. Pray that the kids in the group would come to know God more and more each week through this study and that they would remember that all of us are sinners who need to be saved and that they would turn to this good God for salvation. Pray that they would follow God’s leadership in their life by following Jesus. Filed Under: Exodus, Lesson Plans, What is God Like?